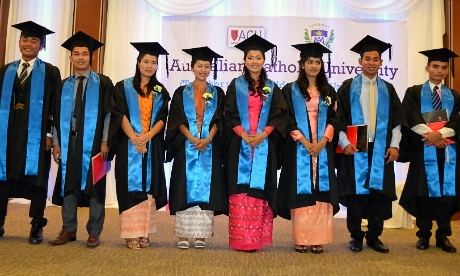 Eight Burmese students, studying on the Thai-Burma border graduated, Tuesday, from the Australian Catholic University (ACU). Each graduated with a Diploma in Liberal Arts. Their graduation brings to a closure 14 months of hard work supported by the staff of the Marist Mission Ranong and the ACU‘s online learning programme. Families and leaders in the Ranong community gathered to honour their commitment and educational achievement. Speaking on behalf of all the graduates, Leah War War called the academic journey profound. “We are migrants who are economic refugees in Thailand. One day, we heard how Australian Catholic University was offering opportunities for all people from Myanmar regardless of ethnicity or religion. This gave us a chance to improve our lives and most importantly gave us hope”, she said. She called their graduation a “dream becoming true”. Worried about poor broken English, Leah War War said that at the start, study was just a dream, a distant hope. “We are amazed at how much we have achieved,” she said.